Below are the show notes for Tony’s show this coming Friday. This should be a good show. We can’t bang the drum too much about Cholesterol and what a complete farse they are. As a 10 billion Dollar per year industry, statins are hard to stop and therefore the myths and pure lies about Cholesterol and mortality rates will continue for years to come no doubt. Listen to Tony and get yoruself and yoru family educated! Don’t be another statistic! Hip fracture risk rises with acid reflux drug use Some older women are more likely to suffer debilitating hip fractures if they take certain indigestion drugs, U.S. researchers say.–The risk of hip fracture was 1.35 times higher among post-menopausal women who regularly took drugs used to treat heartburn and acid reflux for two years compared with those who did not take the medication.—The study published in Wednesday’s issue of the British Medical Journal followed nearly 80,000 postmenopausal women participating in the U.S. Nurses Health Study from 2000 to 2008. Since that project started in 1976, analysis of the nurses’ medical records and questionnaires every two years have provided insight into health and lifestyle risks for women ranging from breast cancer to alcohol use. The findings suggested that women who took the heartburn drugs, known as proton pump inhibitors, and smoked could face more than 1.50 times higher risk of fracture. In May 2010, the U.S. Food and Drug Administration warned of hip fractures among those taking PPIs but concluded that more data was needed for a full analysis. While several other studies have raised concerns about the long-term use of proton pump inhibitors and risk of hip fractures, the results were conflicting and many lacked information on important diet and lifestyle factors that could make a difference. 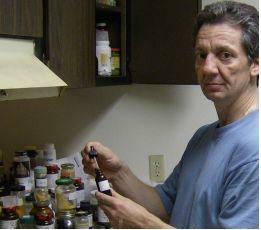 Proton pump inhibitors are among the most commonly used drugs worldwide, the researchers said Use of the drugs increased in the U.S. after they became available without a prescription.–In the latest study, Hamed Khalili of Massachusetts General Hospital and his co-authors took menopausal status, body weight, physical activity levels, smoking, alcohol consumption and use of calcium supplements into account in their analysis. Hip fractures from low and moderate traumas such as falling on ice or off a chair were included. High traumas such as skiing accidents or falling down the stairs were not. Hip fracture risk fell after drugs stopped Over the eight-year study period, there were 893 hip fractures among the participants. Compared with use of proton pump inhibitors, regular use of a milder antacid called H2 blockers was tied to a “more modest” risk of fracture of 1.23 times higher, the researchers said. Given that use of proton pump inhibitors is on the rise, the estimates suggest the drugs could be contributing to a “high burden of fractures,” they concluded. The risk of hip fracture returned to normal two years after women stopped taking proton pump inhibitors, the researchers said.The study’s authors acknowledged drawbacks of the study, such as not having specific information on the type or brand of proton pump inhibitors used. They didn’t confirm hip fractures against medical records, but said the nurses are extremely reliable at reporting the injuries.–The study was funded by the U.S. National Institutes of Health. 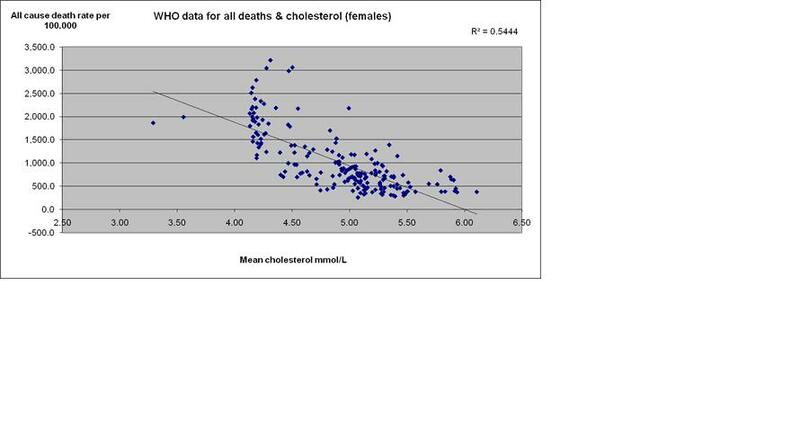 In The Great Cholesterol Con, Dr Malcolm Kendrick analysed some World Health Organisation (WHO) data. The WHO has extensive data from almost 200 countries on more health measures than you could imagine – definitely worth a look one rainy afternoon. This is where Kendrick presented the world with two different Seven Country Studies. Kendrick took the seven countries with the lowest saturated fat intake and then the seven countries with the highest saturated fat intake. Cholesterol-lowering-enthusiasts may need to read this twice – but he found: “Every single one of the seven countries with the lowest saturated fat consumption has significantly higher rates of heart disease than every single one of the countries with the highest saturated fat consumption.”As Kendrick’s two unbiased seven country studies showed – there is not even an association between saturated fat and heart disease – let alone causation. However, Keys published his Seven Country Study and the rest, as they say, is history. The next chapter in The Great Cholesterol Con goes on to look at cholesterol and heart disease (and overall death rates) and quoted many great studies where it is shown that lower cholesterol is associated with higher mortality. However, it did leave me thinking – having run the data on saturated fat and heart disease, let’s just run all the data on the cholesterol and heart disease and get to the bottom of this hypothesis from all parts of the allegations. It actually didn’t take that long – not even a couple of hours one Saturday afternoon. You go to the WHO statisitics area of their web site ( https://apps.who.int/infobase/Comparisons.aspx ) and then pick data for cholesterol from risk factors (how judgemental to start with) and then look under: Global burden of disease (mortality); All causes; Non communicable diseases and then G Cardiovascular disease (shortened to CVD). CVD deaths include ischemic heart disease and cerebrovascular disease – that means fatal heart attacks and fatal strokes to lay people. You find the most recent year where you can get both sets of data to compare like with like. This turns out to be 2002. You download their very user friendly spreadsheet data (CSV) – cut and paste it into a spreadsheet application and then try to remember how the heck to do scatter diagrams! The WHO data is split into men and women. 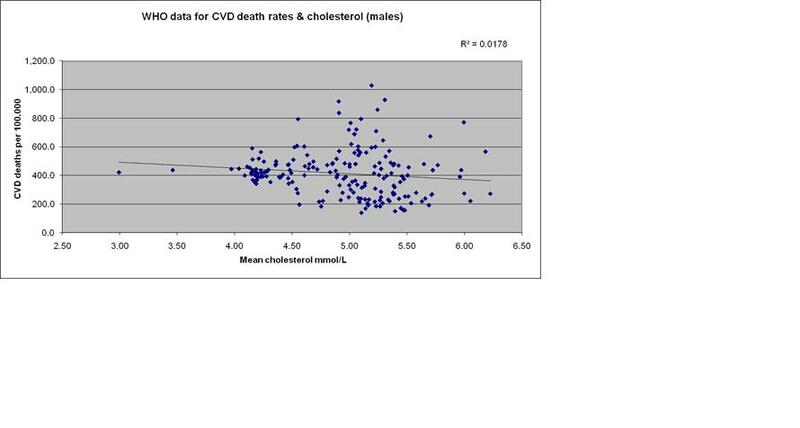 I first did the scatter diagrams for average (mean) cholesterol levels and CVD deaths. Then I ran the Pearson correlation coefficient on these numbers. This gives us the term called “r”. “r” tells us if there is some kind of a relationship: an r score of 0 would indicate no relationship; an r score of 1 would indicate a perfect relationship. A negative r score is called an inverse relationship e.g. the price of concert tickets is likely to be inversely related to the number of concert tickets bought – fewer tickets being bought at higher prices. The “r” score for men revealed that there was a small relationship of 0.13 – however this relationship was inverse. 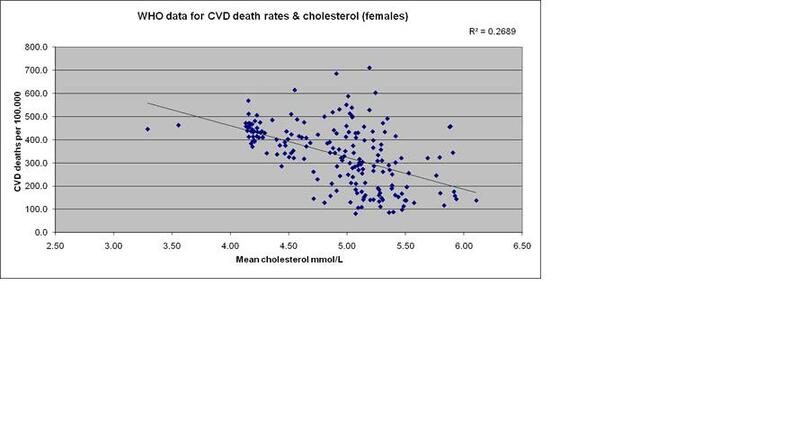 The diagram and correlation shows that higher cholesterol levels are associated with lower CVD deaths and lower cholesterol levels are associated with higher CVD deaths. In women, the relationship is stronger – to the point of being meaningful. The r score was 0.52 – but, again, inverse. For women, higher cholesterol levels are quite significantly associated with lower CVD deaths and lower cholesterol levels are quite significantly associated with higher CVD deaths. Please note that I have added r squared on the graphs below (the spreadsheet application can do this for us) and it can confirm that you’ve got your r numbers right and r squared tells us the strength of any relationship we have observed. All you need to do is to look at the lines going down to the right and wonder how on earth we ever got away with telling people that cholesterol causes heart disease. High cholesterol is associated with lower heart disease and vice versa – for all the data available in the world. 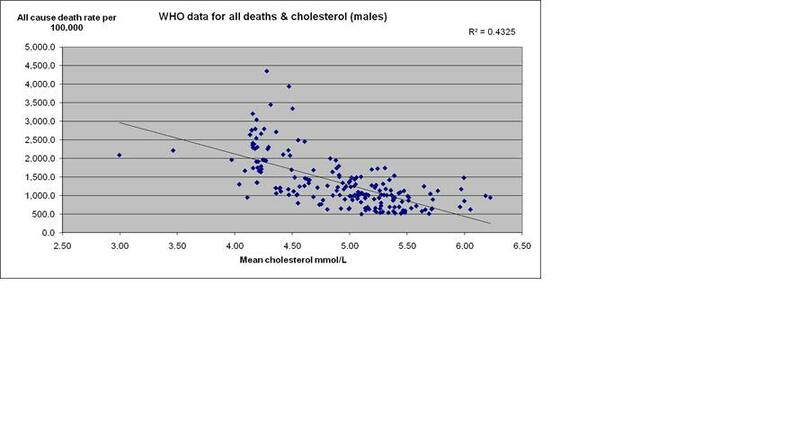 High cholesterol is not even associated with high heart disease, let alone does it cause it. It gets worse. I then kept the cholesterol information and changed the death rates to total deaths – all deaths from any cause – cancer, heart disease, diabetes, strokes – all deaths. You can see the diagrams for men and women again below. This time there is a significant relationship for both men and women: 0.66 for men and 0.74 for women – again inverse. There is a significant association between higher cholesterol levels and lower deaths and lower cholesterol levels and higher deaths for men and an even more significant relationship for women. Ah yes – but a) we changed global dietary advice back in 1977-1983 on the back of an association in Seven (carefully hand picked) Countries that miraculously became a causation even when the association was far from established and b) it is an association that’s the opposite to the one that the world currently holds true and c) that’s what epidemiology is supposed to be about – establish an association and then investigate if there could be any causation or useful learnings. So, let us go out with a new paradox – that high cholesterol is associated with low deaths and then see what dietary advice emerges. For many hunters, including the ones in my own and my husband’s families, the sport is not about killing animals. It’s about hunting, and it’s about parents passing down the traditions they learned from their parents and grandparents. Responsive Management, an outdoor research group inHarrisonburg,Virginia, says that about 90 percent of kids who hunt do so because they grew up around adults who are hunting enthusiasts. My husband is a traditional archer, and one way that he inspired our sons to try the hobby was by helping them make their own bow hunting equipment. They recently found a YouTube video that showed how to turn a PVC pipe into an archery bow, and of course had to try it out for themselves. Quiver – This is by far the best item for carrying your spare arrows. A quiver prevents accidental stabbings and helps to keep the feathers at the end of the arrow from getting ruffled. Websites like Etsy have custom-made quivers of materials like leather studded with medieval-looking steel plating, raccoon fur that harkens to the days of nativeAmerica, oriental bamboo, and more. Even if you don’t plan to buy a quiver from the Internet, websites like Etsy are a great source of inspiration when looking for ideas for how to make your own items. This entry was posted in Health Politics, Remedies, The Remedy Show notes and tagged Cholesterol.Cholesterol con, Cross bow, Eucalyptus, herbal remedies, the micro effect, the remedy, tony pantalleresco. Bookmark the permalink.